Our ladies' lifeguard uniform swimsuits have set the industry standard for quality, comfort, and durability. Proudly Made in the USA by Water Safety Products Inc. under strict quality standards since 1989. Ladies’ lifeguard swimsuits are constructed of 77% nylon with 23% Xtra Life Lycra® for increased chlorine and mildew resistance. H-back one-piece suimsuit with shelf bra and scoop neck. 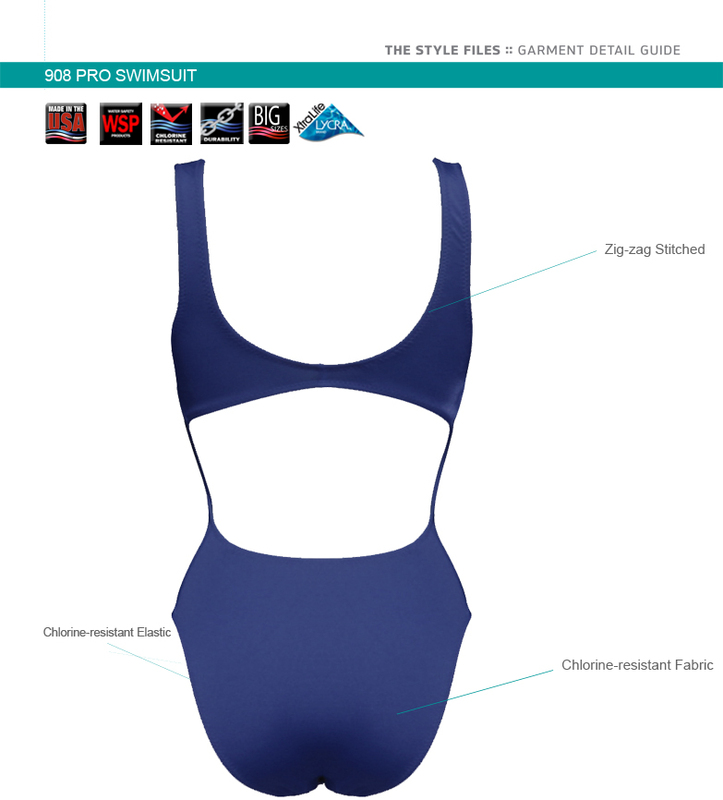 Constructed of 77% nylon, 23% Xtra Life Lycra® for superior chlorine, mildew and chemical resistance. Fully lined front and back. Suit is lined in opaque powder blue for opacity, without compromising the color of the suit when wet. All elastic is fully covered; leg and back openings are zig-zag stitched for comfort and superior fit. All fabrics – shell, lining, and elastic – are chlorine-resistant. Outer Shell is constructed of durable 5.8 oz. warp knit 4-way comfort stretch fabric featuring 77% nylon, 23% Xtra Life Lycra® fiber. Xtra Life Lycra® fiber gives swimsuits superior chlorine, mildew, and chemical resistance. Liner is a comfortable 4.4 oz. warp knit 4-way stretch fabric featuring 80% nylon, 20% Xtra Life Lycra®, giving our ladies liner superior chlorine, mildew and chemical resistance.